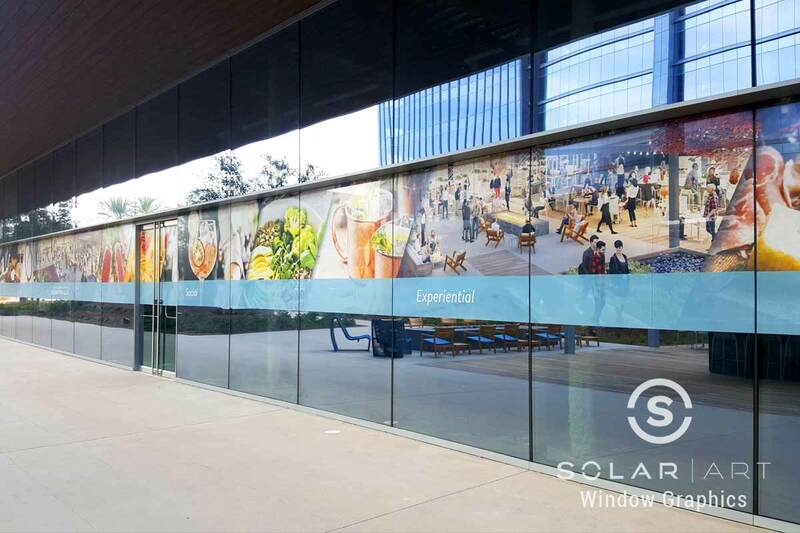 Solar Art installed custom graphics to the Boardwalk in Irvine, California. The Boardwalk is a newly designed office space created to inspire ideas and innovations. They were looking to add custom graphics to several areas throughout the space. In the center of the work place is a large, modern courtyard with cocktail bars, fire pits, restaurants, and a cafe. The restaurant and cafe were being renovated and the client wanted to hide the construction. To keep in theme with the property, they turned to Solar Art to help provide a creative solution that equally advertised the coming space while also providing privacy during the construction. Once the renovation in the cafe and restaurant is over, the custom graphics can easily be removed. In addition to the custom graphics that were used to hide construction, the customer also had custom printed window graphics installed in the office. Custom printed graphics are the optimal way to provide privacy while advertising your space. We met with the client again to determine what their goals were for the look and feel of the artwork for this space as well as the desired material to use. The client chose Clear Focus ImageVue 65/35, which provides one way privacy, allowing you to see out but not in. Our design team created a modern collage of images that reflected the upscale feel of the place. After visiting the site and completing the design, the custom graphics were sent to production. Our crew completed the installation over a two day period to meet the client’s deadline. The customer was extremely happy with the outcome of both installations. 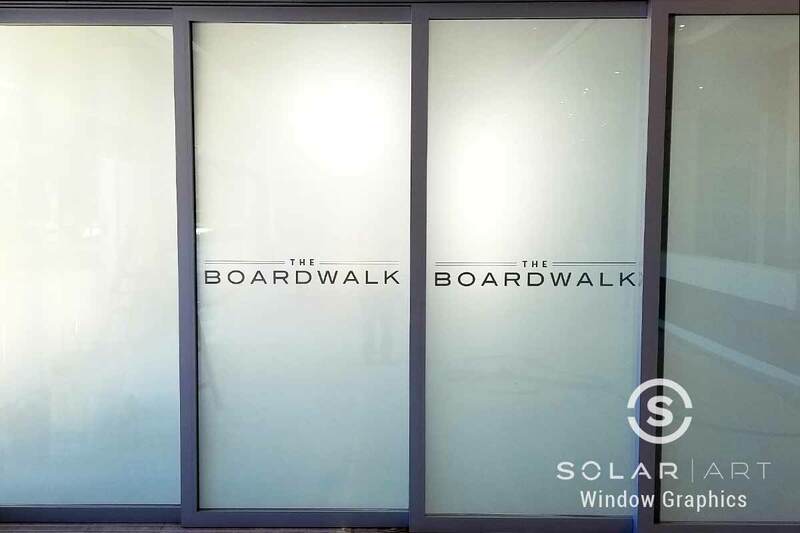 In addition to custom graphics, Solar Art also services solar film, anti graffiti film, security window film and decorative window film. All can be removed and work great in both residential and commercial settings. Contact Solar Art today for a free quote! Custom graphics provide flexibility to create any design factor. They can easily be replaced and work great in both residential and commercial settings. Contact Solar Art to learn more!